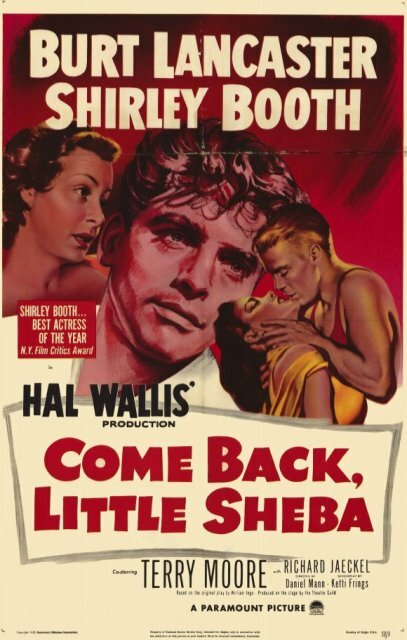 Come Back, Little Sheba (1952) is a drama film produced by Paramount Pictures which tells the story of a loveless marriage that is rocked when a young woman rents a room in the couple's house. The film stars Burt Lancaster with Terry Moore and Richard Jaeckel. 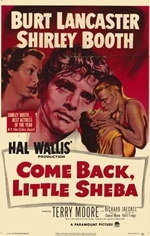 Shirley Booth makes her film debut, which earned her the Academy Award for Best Actress. The title refers to the wife's little dog that disappeared months before the story begins and which she still openly misses. The movie was adapted by Ketti Frings from the 1950 play of the same title by William Inge and was directed by Daniel Mann (making his directorial debut).